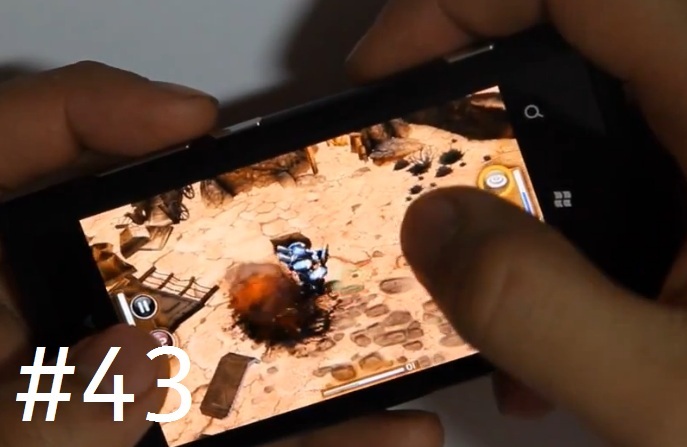 Here’s an impressive looking RPG for your Nokia Lumia 800 called “The Harvest”. You’ve got a choice of 3 mech suits (Well one at the beginning, you have to unlock the other two) and you navigate across the map picking up health packs, weapons, abilities, powerups and killing the enemy. The game looks great and runs really well. The controls are all touch but there’s no traditional virtual D-pad, instead you just touch anywhere to move and touch the enemy to fire at them There are also combination moves/gestures to activate later abilities. The graphics don’t come off too well in the video so you’ll have to try it out. Sound effects/music is awesome. It’s rather expensive at £5.49 but if you do have the option to try before buying to see if this is the kind of game that you’ll like. Still has not been updated for Mango so it will not resume quickly instead loading the whole thing all over again. Otherwise, when you’re actually in the game it performs really well. The Harvest is a science fiction themed Action RPG that takes place on future Earth, some years after the fallout of a destructive alien invasion. These aliens, who have been come to be known as The Harvesters, use humans and animals to create cyborgs: crude amalgamations of flesh and machinery. Mankind, in the form of the Global Defence Force is fighting a war against The Harvesters using human controlled mechanized infantry units. The game world of The Harvest has been designed to provide not only visceral combat, but opportunities for exploration, character customization, and story progression. As players make their way through each game area, they must not only fight off wave after wave of The Harvester horde, but find hidden upgrades, perform story actions, and defeat large and imposing enemy boss units in order to move on to the next area. The Harvest has been designed from the ground up to be the best looking 3D mobile phone game to date, with innovative touch screen gameplay that brings Action RPG games on mobile devices out of the dark ages. Players are immediately immersed in an Action RPG game experience tailored to mobile phones, taking all the best from the genre, while removing the tedium and repetitiveness that is usually associated with games of this nature. At the same time, they are immersed into a deep and intriguing story that will leave them wanting to find out more.